I read a book today. I did a few other things, too. But the book was short and interesting so I made quick work of it. The author divides the cultures of the world into hot and cold climate, or relationship-oriented and task-oriented. 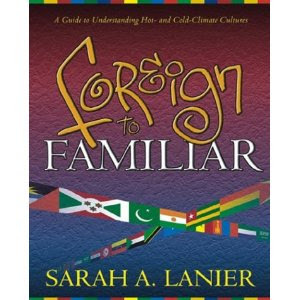 I found it to be interesting and helpful reading for anyone considering a cross-cultural trip. Even for those who have years of cross-cultural experience, it's full of good reminders and observations we are prone to forgetting when we are frustrated. I'm pretty sure we all suffer from ethnocentrism, so we can do to increase understanding between people only makes the world a little bit better, I think.